A puppy is adopted at 8 weeks old... the puppy is nourished, vaccinated and kept for the most part safely indoors, in a warm, comfy environment. He is taken outdoors to potty several times a day and during the night. When it rains, the puppy owner does as much as he can to keep the puppy dry. Very likely, he waits for the clouds to disappear or for the rain to fade into a drizzle. If it still rains, the puppy owner brings out an umbrella and quickly takes the puppy outdoors to potty. If the puppy is reluctant to go potty under the rain, very likely the puppy owner may try to rush him up and gets frustrated in the process. The puppy ultimately learns that rain is something to avoid; indeed, he detects the owner's negative energy about the rain and discovers the goal is to get out of the rain as soon as possible. He ultimately starts associating the rain with something unpleasant. When it stops raining, the puppy is taken out and does its business right away and the owner is happy. This further confirms in the puppy's mind that rain is bad and lack of rain is good. Then the big day comes and the the puppy owner tries to give the puppy a bath. The puppy is frightened but the puppy owner ignores the fear and continues to bathe the puppy. The puppy gets shampoo in its eyes, is scared of all the water poured over him and tries to squirm its way out of the bathtub. Because the bath tub is slippery, this unsure footing makes the puppy insecure and causes him to panic. The puppy owner quickly dries the puppy at this point and lets him free. Months later, the puppy is much older. He is never taken out when it rains and is kept safely indoors. If there are puddles, the puppy owner guides the puppy away from them. Then one day, the puppy owner decides it is time again for another bath, but the puppy has grown quite big now and is reluctant to move near the water. The puppy owner tries to force the puppy into the bath tub again but the puppy freezes. He tries to lift the puppy but the puppy growls and shows its teeth. The puppy owner gives up and decides to perhaps try another day. All the ingredients for a dog afraid of water have been laid out and now the result is a dog terrified of anything related to water including puddles, rain, baths and wet surfaces. My Rottweiler enjoying the Mediterranean sea! In the wild, mother dog most likely raised the puppies in a den, a hole built underground before whelping. 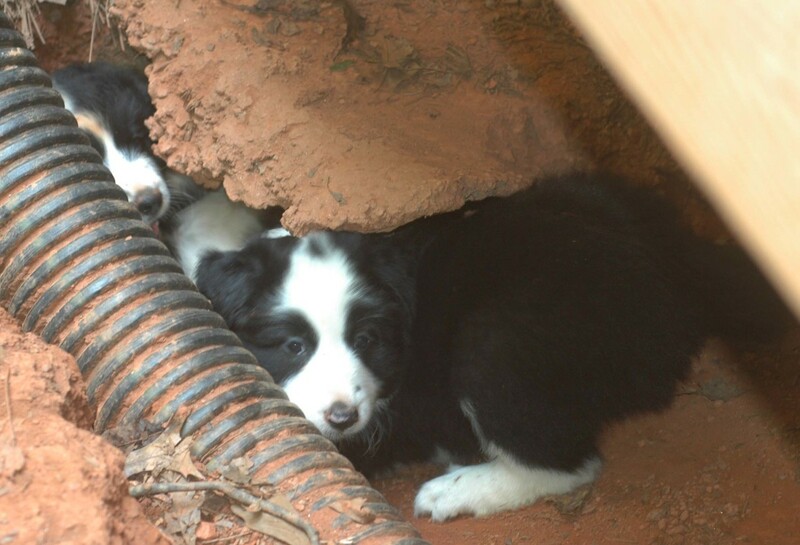 Once the puppy's eyes were open, they explored their enticing surroundings. The pups and nature became one element. The puppies learned about the wind, thunder, lightening, rain and the feeling of wet grass under their paws. The puppies played in the puddles, got mud all over their coats and learned to accept the many intriguing variances mother nature featured each day. Breeders, trainers and books very likely recommend to heavily socialize puppies to people, dogs and other animals during a brief window of opportunity which closes once the puppy is 12 to 16 weeks old. Puppy classes, puppy play dates, and puppy parties are organized to ensure your puppy learns that people, dogs and other animals are non-threatening. But what about rain? Not many dog owners dedicate much time in making rain and the sensation of getting wet something fun and enjoyable! While some puppy owners may give the puppy a bath, often they overwhelm the puppy without paying attention to subtle signs of discomfort. Because puppies during the socialization period tend to store good experiences but also the bad ones, should the puppy have an unpleasant experience with rain or water it may be have quite an effect on the puppy's future feelings about water. Following are common reasons why dogs may be scared of water. Fear of the unknown. Puppies and dogs raised in areas with dry climates or not exposed to rain during puppy hood become fearful of water simply because it is unfamiliar. Overwhelming experiences. Puppies forced to be bathed without much gradual exposure tend to be overwhelmed and frightened, a process known as "flooding". Negative experiences. Dog owners getting frustrated when it rains or getting mad when puppies are scared of water often may lead to negative experiences. Water used as punishment. Dog owners squirting dogs with squirt guns only teach dogs to hate water. Is your puppy or dog scared of water? Not all is lost; some remedial work may help puppies and dogs fearful of water. My dogs were raised in the Arizona desert where rain was quite rare for most of the year. When monsoon season approached, they were scared of rain and the sensation of getting wet. Thanks to a good desensitization and counter-conditioning program they now love the water, as you can see in the picture depicting my Rottweiler enjoying the waves in the Mediterranean Sea last summer! As mentioned, two behavior modification techniques will come handy to help your dog overcome its fear of water. Desensitization involves getting the dog gradually used to water and the sensation of getting wet. 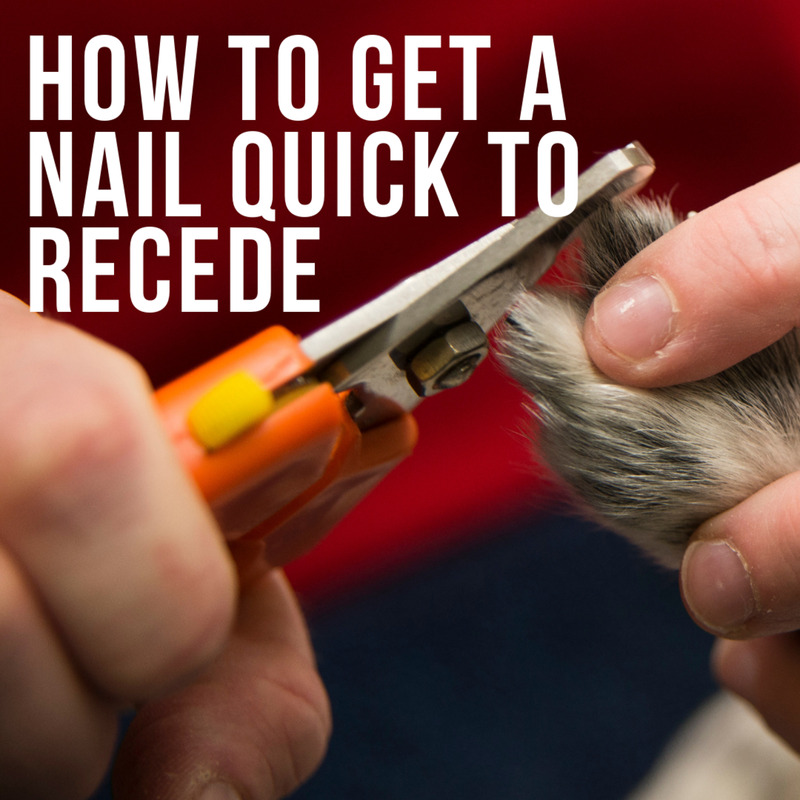 A good desensitization program requires owners capable of working the dog under the threshold. This means you would have to work under the imaginary line that makes your dog react and get panicky. If you are good in reading your dog when it manifests signs of fear, you know you want to avoid getting at that point. For instance, if the sight of the water hose makes your dog squirm, you are overwhelming him. This is too much for him and this experience will make the fear of water worse. You therefore, need to work on keeping him at a distance from the water hose where he appears calm and work from there, sub-threshold. We will go over some easy steps for a a gradual desensitization program. To make a good desensitization program work, you can make it even more powerful by adding counter-conditioning. This means changing your dog's emotional response to water. From getting panicky, you want your dog to shift to looking forward to a bath. Sounds unrealistic? Not at all, you can do wonderful things about your dog's emotional state if you put the effort. Follow are some examples on how to desensitize a dog to water, but keep an eye on your dog for signs of getting uncomfortable. Go too fast and you put up your dog for failure. If you are going too fast, take a step back and find a more gradual approach. The secret is not to overwhelm your dog in the process. Dry your dog after each exercise. 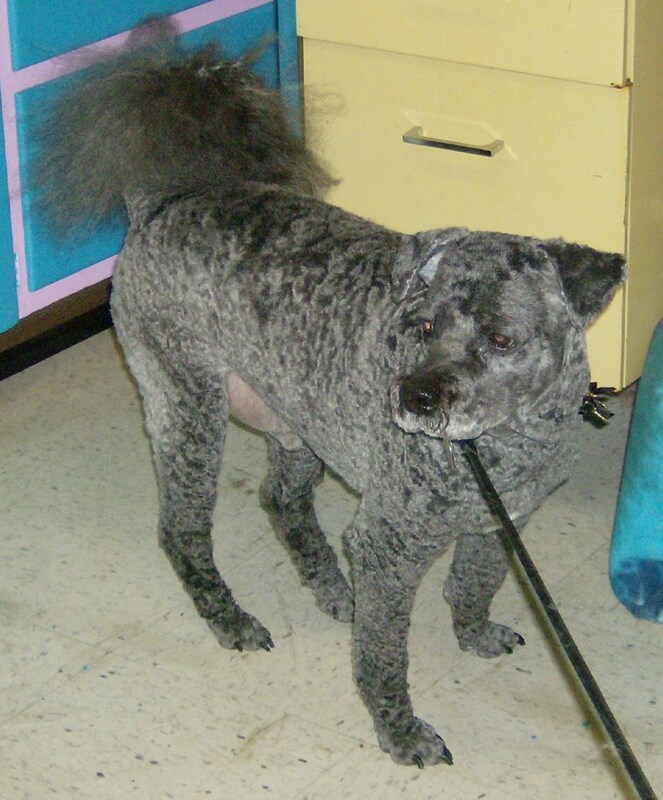 Avoid using hair dryers; most dogs are terrorized of them if not introduced properly. Use a towel instead. Get a sponge, wet it with water and pass it lightly on your dog's back casually one day right before putting his food bowl down. Repeat for three days. Dry your dog with a cloth right after finishing the meal. In the next three days pass the sponge on your dog's back and chest before putting his food bowl down. Repeat for three days. Dry your dog with a cloth right after finishing the meal. As he gets good at this increase the areas sponged. When it rains lightly, get the ball or your favorite fetch toy and get your dog really engaged in a game of fetch. Dry your dog with a cloth upon coming back in and become boring. When it rains lightly, put the water bowl out and have your dog eat its meal under the rain. Get a water hose and start squirting the water in different directions away from the dog. Sing silly songs as you squirt the water and make it look like a fun game. If your dog comes close try to get him to chase the water squirts. As you squirt the water, toss a handful of tasty treats from the sky and make them rain on the ground. Make it look as if the water hose is shooting treats out along with water. Slightly spritz your dog with some water making it look like a game. Give a treat right after the water spritz. It should be like this: spritz, treat, spritz, treat, spritz, treat. At some point, if you get your dog really engaged, your dog will be drenched. This is a good time to rub in some tear-less shampoo and work it in. Sing a song as you massage your dog happily. Continue the spritz-treat game until your dog is shampoo-free. Then have fun rubbing and drying your dog. Water was never so fun! Make sure your dog associates the water with good things. Play and treats must abruptly end the moment you shut off the water. Water ends, fun ends! Make it clear! The Booster Bath boosts your canine buddy to just the right height for quick and easy bathing indoors or out. These tips will aid you in ensuring water becomes a fun and rewarding experience. Never force your dog to be bathed if he is not ready. Go slowly and gradually and you may end up with a pal that will likely be pleading you to open that water hose! Many dogs have a blast trying to catch that water getting out of the hose! Use a tear-less shampoo, all you need is a bad experience of burning shampoo in your dog's eyes to ruin all the progress you made! Invest in non-slip mats. If you are using a bath tub, many dogs are scared of slippery surfaces. A non-slip mat may do wonders. Start outdoors with a great game with a hose and then as your dog starts liking the water, gradually work your way inside. If you dog is scared of the bath tub, try outdoors with a hose instead or a light shower. Some dogs have a hard time getting over negative experiences happening in the bath tub. 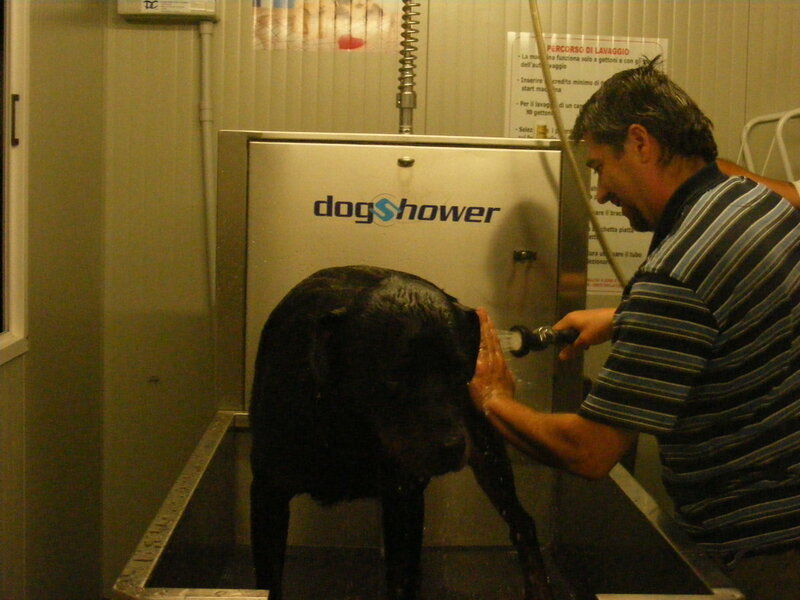 Some dog owners take showers with their dogs to keep it fun and rewarding. Sing silly songs as you play with the water. Start desensitizing your dog to get wet by walking in a puddle. Reward lavishly for getting near the puddle, looking at the puddle and then putting a paw in the puddle. Clicker training with a puddle as a target area works great for those enamored with the training technique. Encourage your puppy or dog to follow you in a small stream of water. Don't force it if your puppy panics. Most puppies and dogs are so eager to be near their owners they will walk in the stream,with a bit of hesitance at first, but once in, make sure you make a big deal of it and praise. Start with low water pressure in the hose. Same with puddles,start with shallow puddles or streams. Many dogs dislike being lifted into the bath tub. Portable steps may be helpful. If your dog does not take treats, try to skip his meal for one time. Feeling hungry, your dog will take them more readily.If your dog still does not take treats, you may be asking too much at once, take a step back and work under the threshold. Have a helper deliver treats as you give your dog a bath to keep it fun. Always work under the threshold. Invest in some great water games for dogs. If you don't give up and your puppy start enjoying baths, something great will happen: the bath itself will become a big reward and you will no longer need to give treats! Disclaimer: Please consult with a dog behaviorist if your dog is displaying aggressive behaviors. Only a dog behaviorist may see and assess behaviors and offer the most appropriate behavior modification program tailored for your dog. Use extreme caution and make safety your top priority. By reading this article you accept this disclaimer and assume full responsibility for any of your actions. 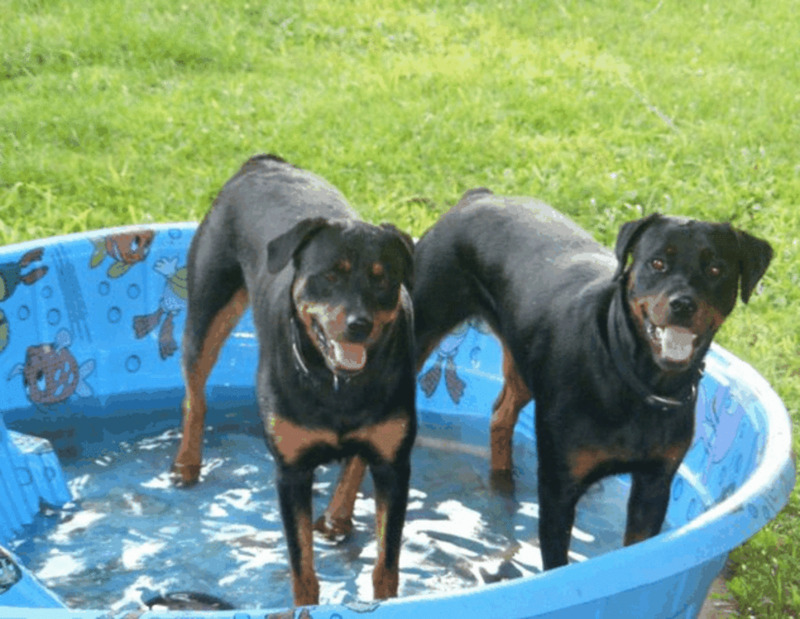 The story of my Rotties scared of water in the dry Arizona desert. My dogs playing with my hubby and the hose! Does your dog love water? He doesn't care much about it. He is not too crazy about it, but tolerates the water. he is terrorized of water. My dog loves swimming but hates a hose bath. He is seven years old and big. How do I wash him? You should approach the process gradually and make it an enjoyable activity. Add treats, lots of praise and play in the mix as discussed in the article. Do not force your dog to have the bath by restraining him; he must voluntarily join in on the fun. Alison, have you tried turning getting wet into a game? Have you tried any of the suggestions in the article? Sing songs, make funny noises, let them try to catch the squirts of water, toss treats in the middle of all that. Make it extra fun and exciting. If they go into the water by themselves, I doubt they are scared of the water. Then, get some shampoo, massage it in, talk to them praising them, fed treats and then rinse them off as you resume the fun water games. Hello, I know I'm kind of late to the party so I am not sure if I will get an answer. Long story short my two dogs hate water. I've tried everything. They're too big to bathe in the house, and they both attack the hose. One of my dogs actually attacks where the water lands if I have the hose on. They go in water by themselves, although the more aggressive one is very picky about it. I don't know if they're scared of water, or just being very stubborn. It's getting to the point where its nearly impossible to bathe them, and with it getting hot and the fleas coming out we need to be able to give them baths. Any tips or advice? Dolores, lots of patience, a step by step program of making it fun and appealing by associating water with play, food and lots of fun. I think I added several tips in the the article as well. My dog is 3mo old and she dose not like the water at all she cry a lot.The person that give she to us did not give her a bath.So how do I help she feel good about it. Thanks for the additional information. You're right, sometimes sedation is necessary and always patient application of your suggestions is the best option. I'm so thankful that you added the story of Buddy the Lab... that is a great way to get people to give it a try. The title change still seems like a good idea to me, but guess what: things I think aren't always that important. Good writing is, though and I look forward to reading more of yours. vote up awesome! Your tips are very helpful.The article is very well-put. I totally agree with DZYMs.Lizzy.This type of behavior is totally inappropriate and distracting to the rest of the serious writers in the community. There's an old rule that says that if you don't have anything good to say then it's better not to say anything at all. Many of us are busy professionals who simply don't have the time to waste reading long, lengthy book reports. This person has commented as a guest, but to the writer, if you can view his or her IP address underneath your comment, then you might be able to flag the page or address this to one of the moderators. @Alexandry...I am the guest that "harshly" "slammed" you by calling you a good writer and pointing out that you didn't address the topic suggested by your title and spent way too long doing so. I must say you have me whipped when it comes to certification and training experience. I have handled many large breeds outside the ring; aided in whelping; observed behavior and appearance to decide on litter names; handled and trained through the first 10-12 weeks for socialization, basic lead control and house manners; overcome many types of bad habits/traits; raised and loved my very own and - as I mentioned - spent many hours at the grooming table during my college years. During those years, I saw every kind of terrible result of lack of bathing and grooming...things that long afterward made my heart ache. When someone asks how to overcome the challenges of bathing a large dog, I know exactly what they are dealing with and what happens if they don't get it done. You are left with an animal who may have body sores from hot spots that attract insects and eventually create a hole filled with maggots. I've seen it. The flea population on a dirty animal will begin to live in any body opening they have access to and they run there when you try to bathe them. I've seen it. If they're "foot crazy", they end up with long toenails that cause their toes to bump up and deform, or curl around until they enter their toes from underneath. I've seen it. The dog owner may be willing to use the excellent suggestions you've made to try to change the psychological reaction to water, but that doesn't address an IMMEDIATE problem that may NEVER get better. That is a possibility you may have overlooked. A large dog who won't do something is a huge physical force to recon with and - you're right - usually they are "crazy" in some way. I've seen large dogs who wouldn't bathe because they don't like the feel of a bath tub or tile under their toes but they were happy to bathe outside with a hose. To some it might seem they "hate water" when what they really hate is porcelain. That is a problem in cold climates, but these days large suburban areas usually have some pet facility where large breeds can be bathed on floor level in an open stall area. I've seen dogs who seemed to hate the water when what they really hated was walking up the ramp to the bathing area or standing in a stainless steel container (sink). I've bathed very large dogs at a local self-service car wash. I just put in lots of quarters and used the "spot free rinse" setting, which gives relatively low pressure, soft water at this location. If the dog is freaked by water and there is a strong need to bathe without time to condition him mentally; or if you've tried to condition him and it just ain't happnin': what then? The most important thing is that the dog is not injured in the process. His upper body needs to be secured in a way that won't allow him to thrash about, damaging his neck or throat. A harness is less likely to cause damage and can keep him on a very short lead fastened at the shoulder...just enough to allow him to stand up straight, no more. You're likely to have a problem with his head if he's inclined to work his jaws at you, but working from behind with a washcloth may help. If he's really biting at you, then use a muzzle as a last resort. Remember: it is a temporary measure to help him be healthy and the minute you take it off you'll be his best friend, unless he has some real mental problems. Sometimes using a harness and a collar at the same time is an answer. Be prepared by having his shampoo and cream rinse (if you use it) pre-mixed in large squirt bottles. Measure the amount of soap needed into a giant bottle and fill the rest with water. This water/soap or cream rinse mix is so much easier to apply and will work even if you start out "dry". This cuts down on the water needed in the experience. There are other suggestions, but I'm not writing a hub here. I just know that many people who need the answers to the question, "How To Bathe A Big Dog Afraid Of Water" own a dog who desperately needs a bath and they don't have the time or skills or inclination to execute a retraining program. It would be great if no dog had to be stressed by a bathing experience, but in the long run his need to be cleaned is paramount. As for your writing: I've always had to edit myself for verboseness and recognize a fellow sufferer. I defend myself against the person who said I was "unnecessarily harsh": on the contrary, I was polite, somewhat succinct and a bit witty (don't you think it was better to make the "dark and stormy night" comment than to say "this fictionalization is beginning to make me yawn"?) Anyway, I like you and your writing here and I'm a fellow lover of animals. It would cure part of the problem I addressed by changing the title to what you used as sub-title. Then, how about writing a different hub that focuses on the issues in your title with links to this article? My condolences on being "wordy". As you can see, I haven't found a cure. Normally I would take an ax to the contents of this reply, but today I see each word as essential. You're right in a way: I am sending myself back into the online writing ring for another round, but it's not courage I lack. Someday when I find a way to send you a personal note to introduce myself and give you my credentials without attaching bragging rights to my ID or making my hubs a target unnecessarily, I will do so. Imagine how much courage it took to make any comment at all when I knew some other "movie critic" would probably vilify what I said. It was my understanding that you, the author, would have the option to kill my comments before they reached the "public". If only sugary sweet applause is allowed here, then we'll never be able to benefit from others' experience or observations. Don't take my word for it: a very wise man said it best, "As iron sharpens iron, so one man sharpens another." Thanks for the tips! Honestly, I'm having trouble with my dog named chowchow lately. He has been afraid of water. It took three for him without taking a bath! I'll consider your tips and apply it on my dog. Great hub! Also, if you are criticizing the paragraphs about how a dog is made fearful of water, because you think it is off topic, consider that if people do not change their attitude towards water and getting a dog wet, the dog won't either. This is a problem I face often when training dogs, owners want immediate results, but they do not want to change their ways. If you really want your dog not to be afraid of water you cannot be protecting him from rain and skipping puddles. Doing so gives water a bad stigma. Those first paragraphs address mistakes dog owners often make and are key to a successful desensitization and counterconditioning program. Guest, it's OK, I take criticism darn well. Sounds like you are perhaps a writer here that didn't have the courage to identify herself. Oh well.. I am sorry but I tend to write in a "wordy" way because I write out of "passion" and tend to really try to go into depth on dog behavior. Yes, this is something I can work on. I am not sure though about the issue of not providing "immediate tips". Not only did I provide a step by step guide on how to desensitize a dog to water, but I also added a comprehensive list of tips and explained the process of how a dog becomes fearful of water. You can read dozens of articles on giving dogs baths but I don't think you may find much that is so comprehensive and written by a certified dog trainer using scientifically proven dog behavior modification programs. Unfortunately, I refuse to give "immediate tips" that work fast because professionally, I know there are no "quick fixes" for modifying dog behavior and doing so would be ethically incorrect because I know dogs take time to change their emotional response towards fearful stimuli. @ "Guest"--whoever you are--your "comment" is unnecessarily harsh, and not something that should be doled out in the public forum, to embarrass the writer. The object of helping a dog overcome an existing fear is, indeed, covered, leading me to believe you merely skimmed the article. Since this article was chosen for a Hub of the Day award, your opinion is your own, and obviously the opinion of Hub Pages staff (and that of many other excellent and experienced writers on this platform) differs greatly from yours. If you like to slam things, I suggest you apply for work as a movie critic. This hub writer is articulate and grammatically correct, which is to be applauded. The article is very long and covers many things not addressed in the title. The vast majority of the information is about how to PREVENT fear of water in the process of raising a dog and about the psychology of dogs in general: useful information, but not what one might expect given the title. Many, many words are used here where an economy of words might give the article a chance to better hold readers' interest and be published in the space typically allotted for such. As a very large pet owner (Gr. Dane), friend of large pet breeders and one who groomed her way through college, I would suggest you focus some of the article on immediate solutions to the need for a bath. As a writer, I would suggest you either take an ax to it, making one word work where five are used and keep it lean (even eliminating some aspects); or, start it with, "It was a dark and stormy night..." and give the dog in the story a name. I have read the other comments and notice that everyone gives kudos without offering any helpful observations. I've read some pretty good HUBS in the past that will be well used and make money...this is not one of them mostly for the reasons I've mentioned. Sorry: I'm not going to make you feel good without adding something that I suspect could make a good writer better. Hope you see it that way. Alexandry, that's a wonderful Hub , useful and interesting. 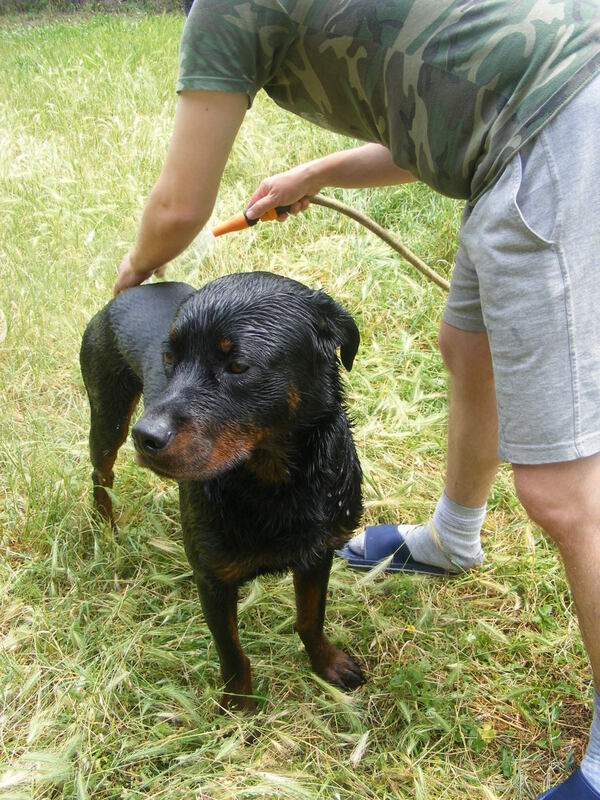 Our dog, was not particularly happy when it was bath time, though he tolerated it after trying initially to run away, and we always thought that he was just being naughty. Later he stopped being so reticent, I now understand why. We used to give him a weekly bath, on every Sunday, and on Sunday's he also had a special treat; which just happened naturally because that was my father's off-day. But probably he associated the two together and so taking a bath and having done with it may have meant for him the special Sunday treat. You elucidate the whole thing so well, I will go around telling all dog owners about this stuff. Congratulations! This hub is so timing when I came across it. I just had my cockapoo a bath inside the tub. He is pretty well behaved except when I start trimming his fur, but he does listen to me with my constant kisses. I just can't get him to sit in order to be more relaxed in the tub while I groom. He was too timid before crossing or playing along a shoreline, but happily he learned to be brave just to get his ball out off the water. There are times when he become hesitant to even cross waters just above his legs, but we cheer on him from the other side, then, he skips. It makes us cheer with joy! 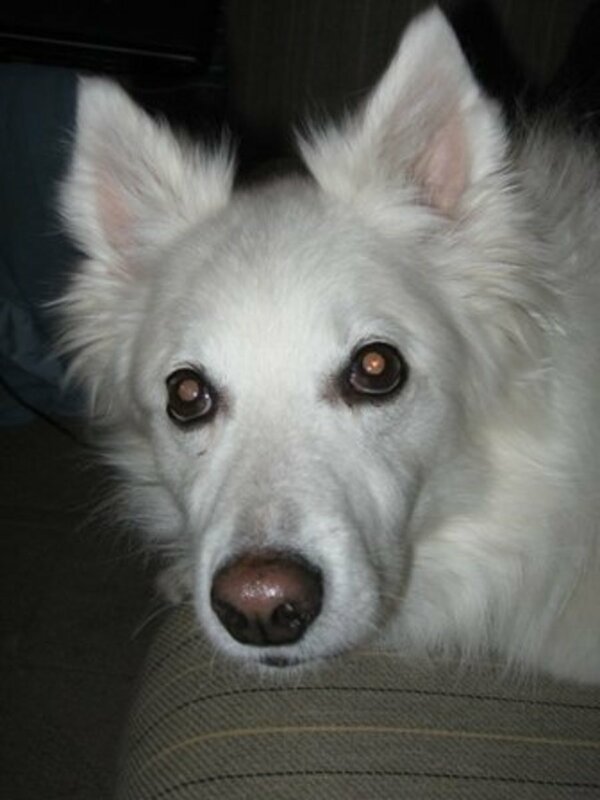 I enjoyed reading this article and great tips for me to explore with my furry love as well. And...CONGRATULATIONS! GREAT HUB! great article! I will be sure to use these tips to help our 5 year old lab mix. We adopted him 2 years ago and has always been terrified of baths, rain is fine, he'll even swim in the river but if we even look at him and say "bath" he turns the other way and hides upstairs. In the warmer months I bathe him outside because lifting 82 lbs of dead weight into the tub is not fun for either of us. This is such a very useful hub! Voted up! My dog was afraid of water, but repetition, positive reinforcement, treats helped me bath my dog. My complaint is that I can't stay dry...the dog shakes her coat and I get soaked too. Dogs like people remember good and bad experiences. You hub is very helpful to all dog owners. Thanks. What a fantastic insight into how it is that many dogs are afraid of water! Wonderful hub and I will try these tips with my two dogs. Congratulation on the hub of the day! This hub is very informative and useful. Thumbs up to you alexadry. Thanks for sharing. Congratulations of Hub of the Day! Well done, thoughtfully planned out and well-explained. 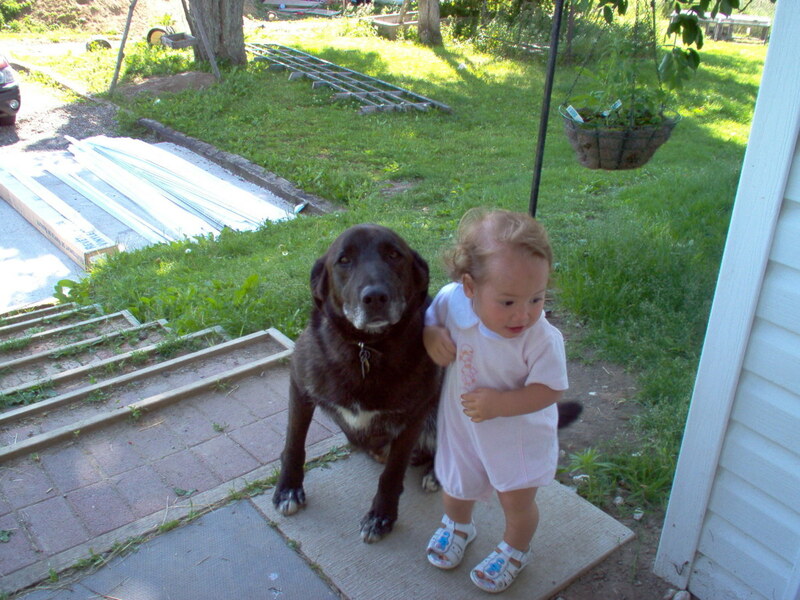 I voted that my dog doesn't care much for water, but that refers to a dog I used to have when my kids were young...he has long since crossed the Rainbow Bridge. However, he was not "afraid" of water--he just didn't care much for it. We lived about a mile from the beach, where the weather was pretty damp and foggy all summer, and we rarely got above 65 degrees...75 was a real heat wave, for 2-1/2 days, and on the afternoon of the 3rd day, the fog would come rolling back in. He would go out in the yard willingly enough in the damp weather, for that was what he knew. But if it was really pouring rain, he went out & got back in as quickly as possible. One year, the yard turned into a small lake after a few days of drenching rain. It was funny to watch him out the window--traipsing across the "lake," and stopping each step to shake his paws like a cat would if stepping in water. As for baths, I always used the tub...he would either jump out, or shake vigorously while full of soap. I taught him not to jump out, and I taught him to wait and shake on command...AFTER I'd pull the shower curtain closed! Before that, it was a matter of donning full rain gear or a swim suit to bathe the dog, and a big mopping-up job afterwards. Now, we have only cats--we no longer have the physical stamina to keep up with a dog. Very useful and informative hub. Voted up. Great hub. Congratulations on Hub Of the day! Thanks all for the congrats! Jester 98, limber tail! I wrote a hub on this condition when a dog's tail gets wet and stays limp. Mary615, if the towel is an issue, try to take it out every day and give a treat. She should get used to it, and since you take it out every day and nothing happens she will eventually no longer associate it with the bath. If you do often, you will change her emotions about the towel from "oh, no the towel! bath time!" to "cool the towel, treat!" best wishes! I love your tips on making water fun. Congratulations on Hub of the Day! great tips. Congratulations on Great hub of the day!! This is very well thought out and comprehensive hub. Though I have a newfoundland (water dog), I found the tips on desensitization particularly helpful as they could easily be modified and applied to various training issues. Sharing this, voted it up. This is one of the most important ideas I have worked hard at getting new and old dog owners to understand. Do not just turn the hose on them. When I worked at one of the chains of pet stores that offers grooming I took my turn to fill in for an hour. We had dogs to bath. I was appalled at the process. A new nozzle with soaping dispenser was installed. It reminded me of fire engine hoses. The one major chain never wants you to know about it. But if your dog is freaked by going, that is one good reason why. It is easier to bath your dog at home. 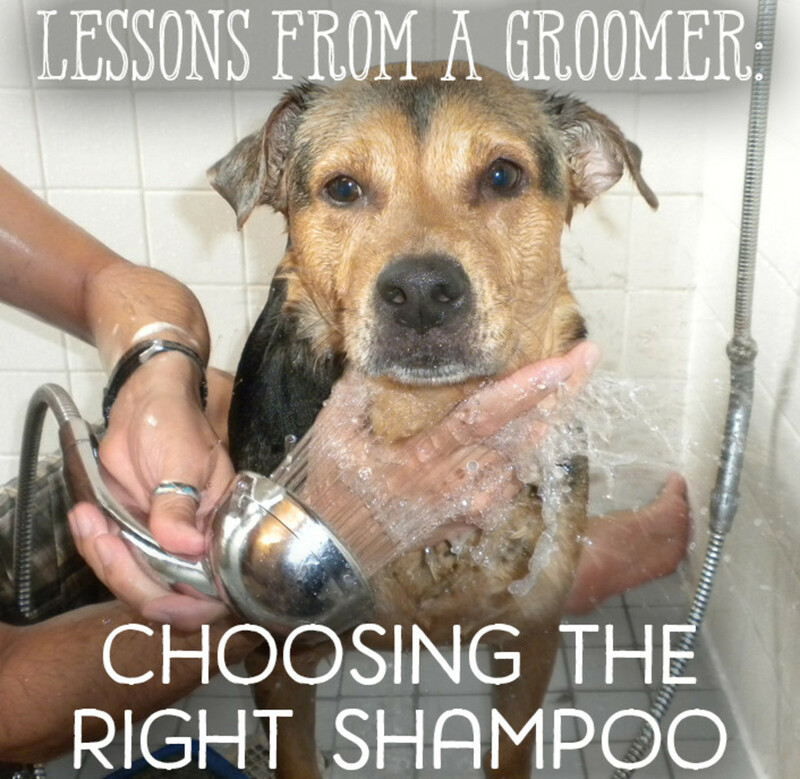 Check with your groomer about how they bath your dog. Majority do not put them in a tub. Thank you again and blessings. Great tips! Make sure the water is never to cold. We did that once with our dog and his tail was limp for over week. Poor guy. Thanks for sharing these wonderful tips. My dog, Jerry, hides under the bed when it is bathtime.Will definitely try out your ideas. Sounds like great fun too! Congrats on being the hub of the day! Voted you up & useful. The Springer we have groomed so he's good with getting a bath. Our Reno didn't like the water and he was part lab. He would let us wash him growling the whole time. Congrats on Hub Of The Day. Lots of good information. Congratulations on hub of the day!!!. You have some great tips.I love the pics of your Rott..He looks very nice. Congratulations on Great hub of the day! This is very well-written and presented. My dog looks like the one in the picture and he's water-phobic too. We don't bathe him in the tub though. He's an indoor dog as well so when it comes time for a bath, my dad takes him outside and bathes him with the hose. As soon as he lathers him up with shampoo, he starts shaking it off. It's really funny! As far as rain and thunderstorm, dogs can sure detect when there's bad weather. Thanks for all the useful tips. If I ever get another dog, I will be sure to encourage it to enjoy water. Now if you can write a Hub on how to get cats to take a bath, I would be very interested to read that one. Great job with this hub! There is so much useful information, and you did a great job organizing everything. Well deserved HOTD! Great Hub Alex. Congrats for being HOTD. It's a good news that my dog "randy" love to bath and i always being more happy do it.We played more times when he bath. Thanks for sharing such a great hub. Congrats on HOTD! You have some great tips here. My Miniature Schnauzer tolerates her bath, but I have to be sneaky about it. If she see me get the towel, she will run under the bed. Once she is in the tub, she's OK. I really appreciate the explanation you gave. It makes perfect sense. I am guilty as read of making my dog afraid of water. I will try these techniques as outlined. I'm sure they will work as my dog LOVES treats and all functions related to getting them. Smile! This is so well thought out and explained so that a novice at washing a timid-about-bath dog. My little pup was not so much on baths at first. I used warm water and cajoled him into the whole bath things and finally he came over. Our big dog (both of my dogs have gone to puppy heaven) was not keen on bathing either. But my daughter is a dog whisperer I am sure and could get our Kelly Girl calm enough to bathe. Thank you for sharing this for those who may have had an unpleasant experience in this area. My dog doesn't mind being in the rain, but he hates baths. I'm going to try bathing him outside and see if I can make a game out of it as you suggested. Voted up. Such a nice hub on caring for dogs. I'm fortunate enough to have dogs that love water. However, one of my dogs has severe anxiety when it comes to load noises. No it's not! Dogs are always learning. I had a neighbor bring me her dog that hated water and I made it fun and he allowed me to give him a bath and looked happy too, just get creative! Most dogs want to have fun and the great thing is that water can really be fun! My dogs didn't come home as pups. the oldest female, who I did the vote on, hates getting wet. She will go under the bed during the rain, come out when she thinks it's safe and I get her outside, with me going along. She has me well trained-ha! Great tips and it's never to late to try. We started at an early age to get our dogs use to water. Some liked it, others didn't or were more cautious about getting wet. It was a blast to watch how each one reacted to water. One day, one of our dogs surprised us by jumping off the boat and into the water. I paniced a bit because it was a small dog, without a life jacket, in deep water. She loved it so much that I will have to invest in a life jacket to ease my fears. Thanks for the information and helpful tips! Thank you! I think the weather where the puppies are raised play and early exposure play a big role in getting a puppy used to water. We use to live in Seattle when our shepherd was a puppy, so she is use to walking in the rain and has never been afraid of water! ;) This Hub is very informative, and I love the pics of your Rott! He looks very sweet. Great hub - big thumbs up, make so much sense too.